It seems like the recent release of Kinect for Windows has caused a resurgence in Kinect hacks over the last few days. The official Microsoft SDK makes it easier than ever to come up with interesting new uses for the depth-sensing camera system, and now there’s a Kinect hack you can play with from the comfort of your own home without even buying a Kinect. 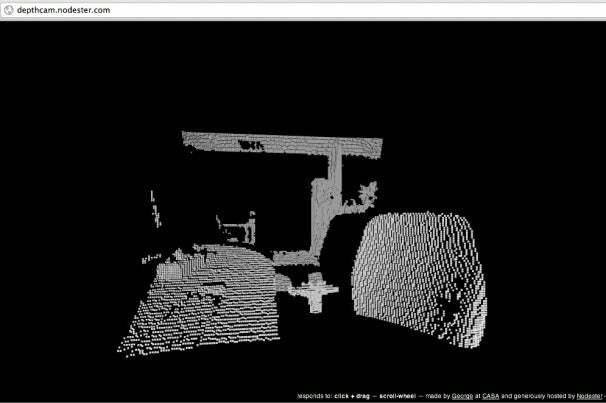 Take a look at the Depth Cam, a live HTML 5 webcam built using the Kinect. With it, you can click and drag to rotate the 3D field generated by the camera, and you can use your mouse’s scroll wheel to zoom right in your web browser. The Depth Cam is the brainchild of George MacKerron, who scripted the project together using WebGL and three.js. The project still has some limitations: It uses a highly compressed version of the data from the Kinect and currently only works in Google Chrome. If you’re using a different browser,you can take a look at the short video MacKerron made of the project on YouTube. If you want to try running a Depth Cam of your own, you can grab the project's source code over on GitHub, but be warned Zs MacKerron mentions in his blog post on the project, the setup is a bit complicated.